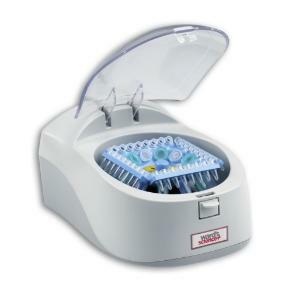 Ideal for quick spin downs, this centrifuge features a single rotor for spins of up to 5,500 rpm at a fixed speed of 2,000 x g. With twice the capacity of traditional minicentrifuges, the unit can spin twelve 1.5mL tubes and four PCR strips simutaneously. It’s near silent operation and lid that quickly starts and stops operation when closed or lifted, respectively. 100–240V.